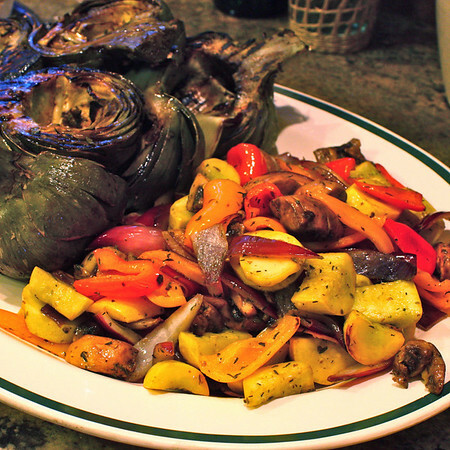 Liv Life: Balsamic Grilled Artichokes and another day in the Yosemite Valley! 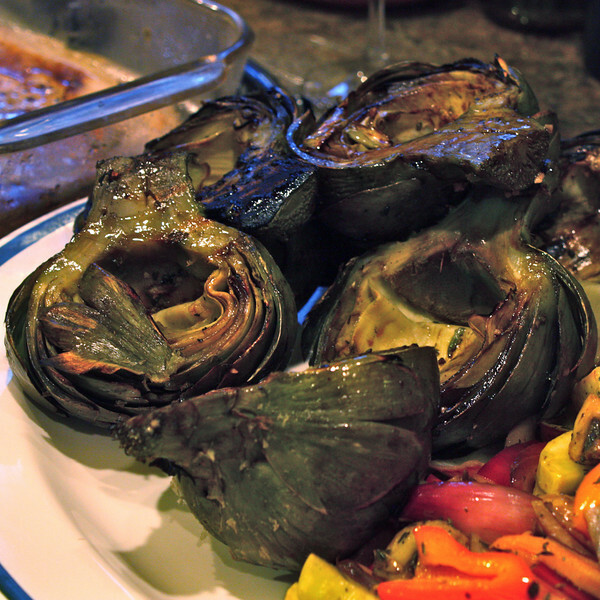 Balsamic Grilled Artichokes and another day in the Yosemite Valley! The Thursday of Spring Break had the adults in our party heading back into the Yosemite Valley for a Valley photo shoot, the kids worn out from the adventures of the prior day's tour. Along with us, our hosts in Oakhurst having literally hundreds of days in the Valley and a neighbor who is a Yosemite Volunteer, who could ask for better guides?? Packing 3 DSLR's of varying levels of wonderfulness, numerous lenses of differing lengths, 3 tripods and 1 Canon pocket camera (my husband's!) we set off in hopes of that much sought after crystal clear cerulean blue sky highlighting the granite monoliths of El Capitan and Half Dome amongst the gushing waterfalls. 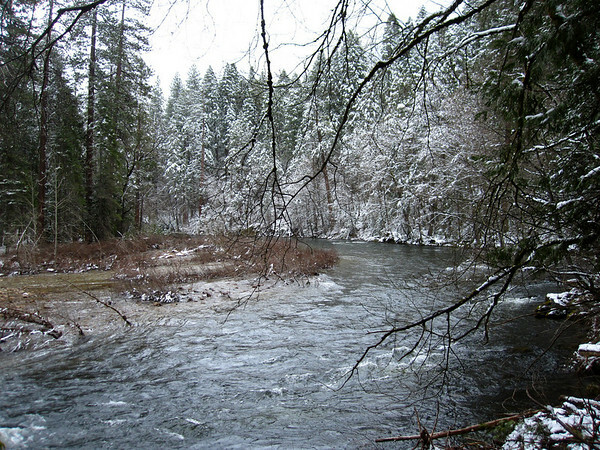 With our hosts providing a steady stream of Yosemite lore and history we made our way past the raging Merced River. Kent pointed out various points of interest along the way including large rock fall areas illustrating in vivid detail how much of the Valley was created. I can't begin to say how much we enjoyed having our own personal tour guides for the day who not only were experts on the Valley itself, but who are "in the know" on perfect photo spots. My husband was a trooper and he kindly pulled over at a seconds notice without complaint when one of us yelled "Stop! I need to take a picture of that!". Pulling quickly to the side of the road and chuckling as Tom and I hopped out of the car running to some remote site we noticed he often trudged along behind us to take a few of his own. One such stop provided this shot of what I call the "Ice Tree", one of my favorite shots of the whole trip. The tree, set amongst the rocks and waterfall, just seemed to gleam with the spray of the water freezing on its branches. Set against the green of the other trees it was simply stunning. Once again Mother Nature had her say and gave us anything but those crystal blue skies. Dressed in my borrowed boots, extra layers of clothes, a warm scarf and borrowed gloves I still froze my fingers and toes (along with the rest of me!) in the 27º temps (not including wind chill!) and falling snow. Covering the Valley floor and trees with a fresh layer of glistening snow the four of us were treated to stunning views that only days before were showing signs of spring. Starting our day in the Valley at Fern Creek, a favorite stop for our host, Tom, we shot a number of photos of this small water flow which provided differing colors depending on the available light. The reflections on the slow moving water lit up our lenses giving one gorgeous shot after another. 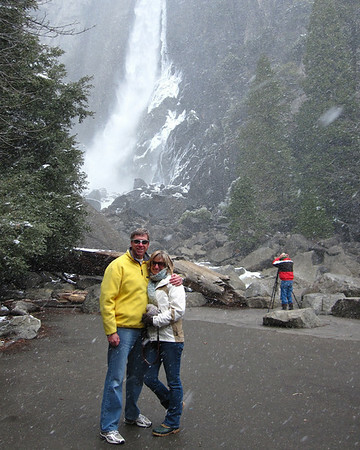 Snow at Yosemite Falls - that's Tom in the background! Next up the Yosemite Falls were flowing as much as or even slightly more than the day before, the Frazil Ice however was barely visible. 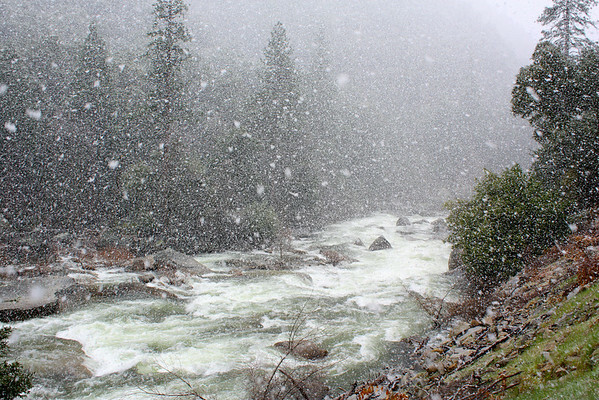 Arriving at the Lower Falls viewpoint the skies opened up and the wintry scene became even more magical with a full on snow shower. Living in San Diego, we see snow so infrequently that the gently falling flakes were a real treat. Freezing our fingers out of our gloves snapping photos we deemed it time for a hot drink at the Ahwahnee. Just around the corner from the falls we found a perfect spot in the bar area and thawed ourselves in the warm surroundings. After my average meal the prior day in the Ahwahnee main restaurant I was somewhat hesitant to order much off the menu. With assurances from our hosts though, I chose the chili and was more than pleased with the hot, cheesy bowl that arrived quickly. The others ordered hot drinks including the Firefall (Hot Chocolate with tequila and a hint of cinnamon) and Keoke Coffee. Again, the drinks were somewhat aggressively priced at $9 a piece, but with the snow falling outside the large windows and the warm fires burning in the hotel I was completely content so spend a bit of time enjoying the chili and drinks. Definitely one of the high points of our day in the Valley, simply a lovely location to warm your bones and rest your feet a bit. After more touring we left our snowy winter wonderland and headed for home. Liv had spent the day with her brother and Tom's wife, Fran, and lucky for us Liv and Fran had been cooking for a good part of the day. Walking into the house we were greeted with aromas of roasting pork and rosemary, artichokes that had been prepped for the grill along with other veggies and a salad ready to be tossed. What a treat to have such a meal prepared for me. Fran wouldn't let me do dishes either, talk about a true (and much needed) vacation! Artichokes have not really been high on my list since I was a kid, but with urging from everyone at the table I gave these gorgeous grilled beauties a taste and found myself promptly reaching for seconds. Marinated with a simple mixture of oil, balsamic and crushed garlic these little guys couldn't have been much easier to put together and the flavors were out of this world. Sipping a glass of '08 Zin from Tom and Fran's personal vineyard we relaxed near the fire, content and warm, the memories of the day filling our conversation as we sipped our wine and drifted towards a good nights sleep. Fran's recipe isn't particularly exact... It is adaptable and changes based on ingredient availability and mood, but here we have a general direction for the tasty little guys. I also found this site and this site showing photos of the artichokes and describes the trimming and marinating processes. Combine oil, balsamic, crushed garlic, and oregano in desired amounts (Oil and balsamic about a 1 to 1 ratio, more or less to your preference) and whisk to combine. Set aside. Bring a large pot of water to a boil. While warming the water, trim leaves from the top of an artichoke. Remove the outer layer(s) of leaves from the stem end and snip all remaining spiky tips from the outer leaves. Trim an inch off the bottom of the stem and use a vegetable peeler to remove the fibrous outer layer. Slice the artichokes in half lengthwise. Scoop out the choke (purple leaves and spiny hairs in the center) being careful not to remove the heart. Brush each half generously with oil/balsamic mixture and sprinkle with salt and pepper, or alternatively, place into a zip lock bag and pour oil/balsamic mixture over and refrigerate to marinate for an hour or so. When read to grill the artichokes, heat the grill to a medium high heat and grill the artichokes until tender and lightly charred, about 5 minutes per side. Transfer to a serving platter. Serve warm, at room temperature or chilled. Note: I have not eaten artichokes since I was about 9 and have avoided them at all cost. These however were simply fantastic and I can't wait to try making them myself!! Those artichokes look so good! As Easter approaches, I'm always looking for different ways to prepare artichokes, so thanks for sharing. 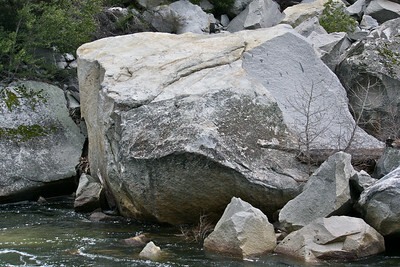 I love Yosemite - especially camping out there in the summer (when you're lucky enough to get a spot). I guess with the snow you weren't able to hike up to the top of the falls. Your pictures of Yosemite are just beautiful.. 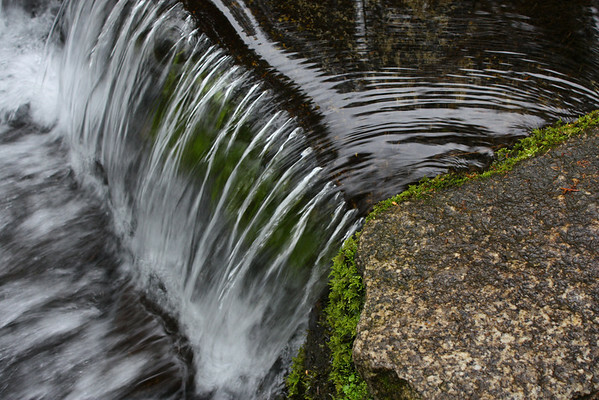 I especially love the one of Fern Creek... Lovely! What a wonderful sounding day and a great meal to finish it off. It makes me want to see some snow! BTW - we shared the pudding with our next door neighbors and they loved it too. I must say again you took beautiful photos...I love the look of that chilli you had and your artichokes and vegetables looks delicious too! Your Yosemite pictures really have me wanting to visit and I agree with your description of the Ice Tree--stunning, indeed! Maybe as a consolation, I'll just make your grilled artichokes. I know my husband would love me for it. They're his faves! Sounds like you had a wonderful trip, even with the cold weather. Your pictures and travelogue are fantastic. 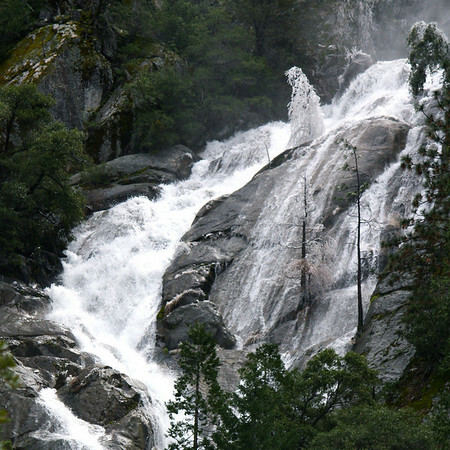 Makes me want to see Yosemite, in the summer:) No snow for me! I made an appetizer with the baby artichokes, but now we'll have to grill them. Those pictures are so beautiful... glad you had a great trip! And glad you tried these delicious sounding artichokes... yum! Fantastic pictures as always! I am so glad that your trip went so very well, it sounds like you had so much fun and there was a TON to see. I love the grilled artichokes, I have to admit I have never even thought to do that but now that I see it I have NO IDEA why I never though of it...wow they look awesome! I love the holiday you had! Even with the chilly temps, seeing those beautiful sights are worthy some numb toes. Having those gorgeous artichokes to come home looks like icing on the cake :) Thanks for sharing! I have to get up there before the snow is gone. It's so beautiful. I think your ice tree photo is my favorite too. So glad you hauled all your gear. I think this is my favorite post yet, but I'm a sucker for nature. Your artichokes sound good too. Hope you are finally defrosted. I want to visit, looks so pretty! My BF looooved artichokes. I showed him this and got the raise of an eye brow - which is a lot coming from him. Can't wait to try it. Those pictures of the park are stunning! Oh, my, I want to join you in all the splendor of Yosemite! For now, I'll just enjoy your fabulous photos. The artichokes look incredible...simple and delicious! Sounds/looks like. Fabulous trip to Yosemite! We just got back from Mammoth. Lots of snow too! I just love artichokes, and both mynkids do to. Have you ever had them grilled at the Beach House in Caediff? Love those! I'll definitely be trying your recipe! Snow! I'm sure Yosemite looks stunning! I am so envious. Thanks for demystifying artichokes. I will have to try prepare them for myself. Balsamic grilled artichockes sound delicious! Awesome pics. Wow - what beautiful pictures. Those artichokes sound amazing - a fresh take on them then just boiling in water, I will have to try soon!! 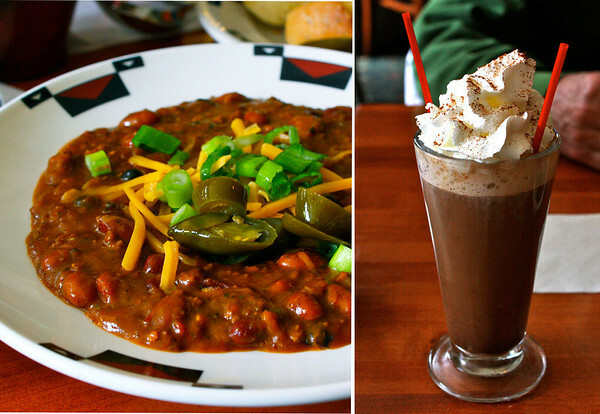 And that hot chocolate looks and sounds delicious....yummy! The vinaigrette sounds a lot like the kind I make. We just use it as a dipping sauce. I like the idea of boiling them, marinating them, then grilling them. Will have to try it soon! Tuscan Lemon Muffins... and a poem by Liv!